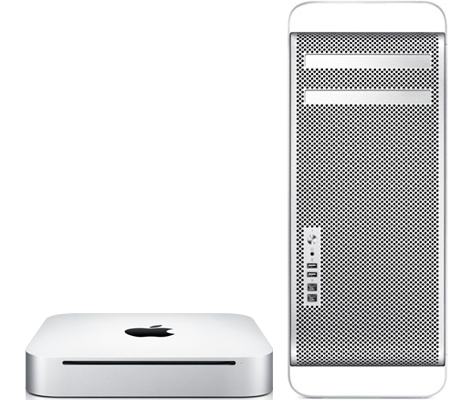 Apple’s Mac Pro and Mac Mini, Launching this August? As the rumors say, Apple will launch their new Mac Pro and Mac Mini - that is equipped with Sandy Bridge processor and a Thunderbolt port - by the end of July or first week of August this year. Apple added the latest Intel Sandy Bridge processors and the new high-speed Thunderbolt port to their Mac pro and Mac mini desktops, that is said to be released in August. Mac Pro’s last update was in late July 2010. The tower was improved to 12 processing cores with Intel Xeon processor, making it almost 50% faster than its predecessors. Then a month before the Mac Pro update, Apple released their redesigned Mac Mini that includes a HDMI port for easy connectivity to a high resolution television. It also has a built-in SD card for grabbing photos and videos from digital cameras and even phones. All of these are packed inside a 7.7-inch square and 1.4-inch thin device that costs $699. MacBook Air is also expected to have its upgrade in the hear future. It was assumed that MacBook Air will have a Sandy Bridge processor and Thunderbolt port. Apple is expected to hold off on releasing any new Mac hardware until its next generation operating system, Mac OS X 10.7 Lion, hits the market in July.